I now realize, after starting this blog, that I really don’t make a lot of desserts at home. I’m not sure why that is. It could be because I possibly enjoy savory foods more than sweets. It could be because I’m not that confident in my baking skills. It could be because I receive plenty of baked goods/desserts from others in my life. Whatever the reason, I’m trying to focus some of my efforts on making more desserts. Here is a ridiculously easy dessert that would be great for the holidays (Halloween – New Year’s) or any time really. 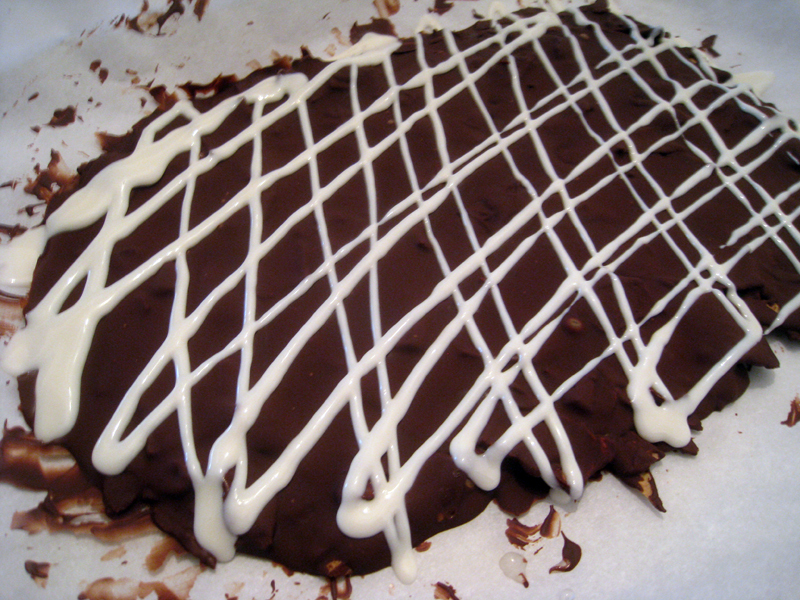 The idea came to me when I saw a recipe for peppermint bark that was also really easy. In that recipe, the author (apologies to this person whom I forgot) didn’t get overly fancy with peppermint extracts or whatever. She just crushed up some candy canes and sprinkled them over a thin layer of melted chocolate and York Peppermint patties. Brilliant in my opinion. 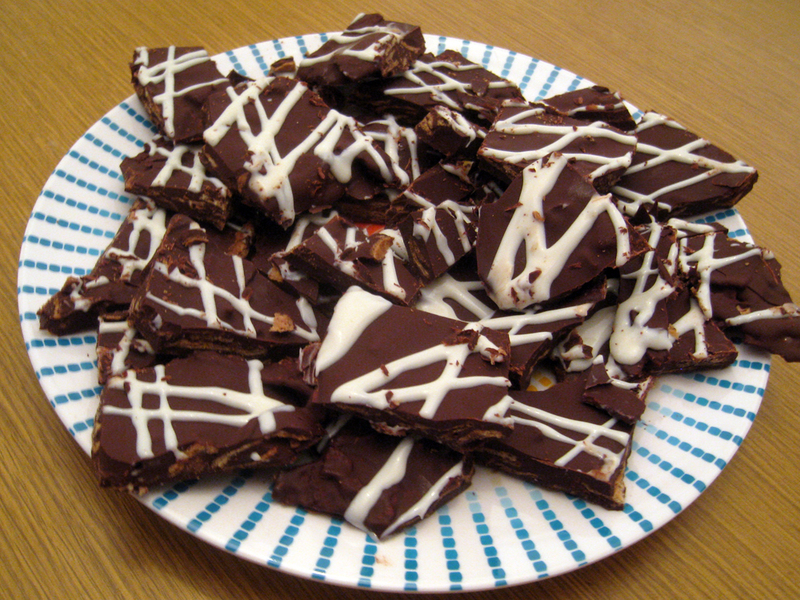 The recipe below for my own chocolate bark is even easier than that and you can make it really quickly. 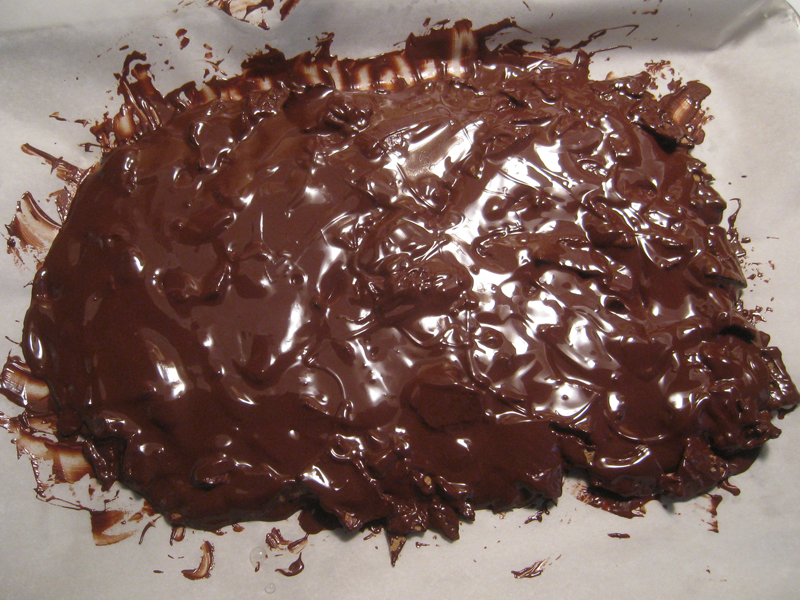 Makes about 1.8 pounds of chocolate bark (28.64 oz) at 3580 calories total or about 125 calories per oz. Note: You can use milk chocolate or any other kind of chocolate, but something like peanut butter chips is trickier. Note: You can also use something else like white chocolate or peanut butter. Fill a medium sauce pan half way with water and place on medium heat. Then place a small sauce pan inside the medium sauce pan. If you have double-boiler style pots then just use those. This is extremely important because you don’t want to put the pot with the chocolate directly on the stove and risk burning the chocolate. 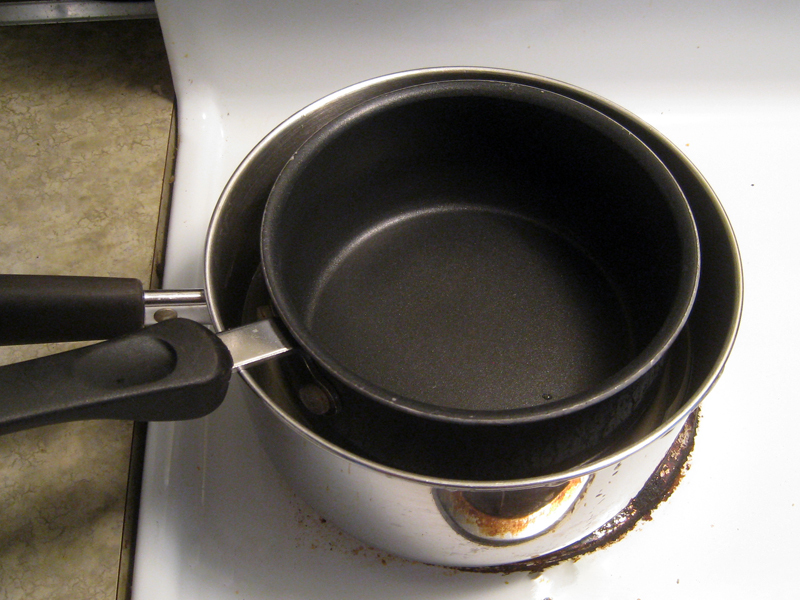 The double boiler method helps you manage the heat. Put one 10 oz bag of the chocolate chips into the small sauce pan and let them sit as the water in the medium sauce pan starts to simmer. Spread a piece of parchment paper or wax paper over a baking sheet/pan. 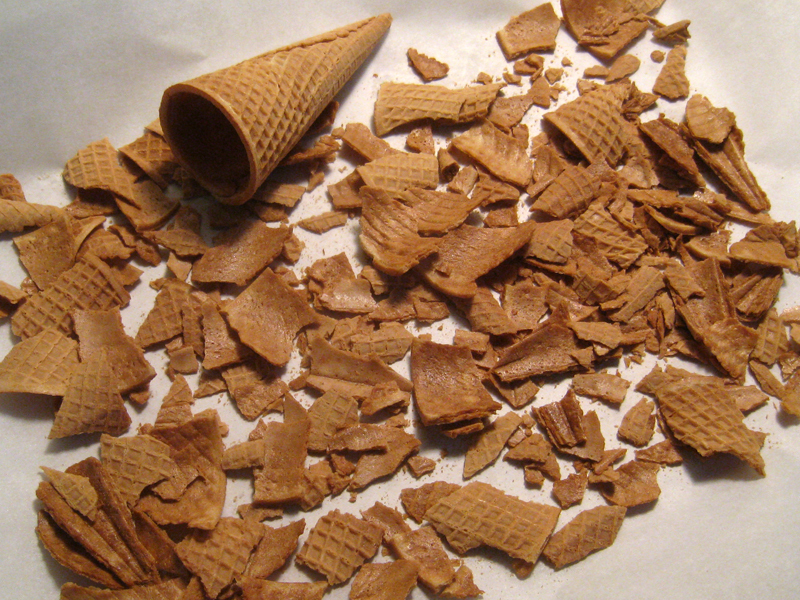 Crumble six sugar cones into various sizes (but all flat pieces) onto the parchment paper and keep them together, but one layer. As the water starts to heat up, stir the chocolate slowly and as the water gets warmer/simmers keep stirring the chocolate until it is essentially a thick liquid. Do NOT use a cheap rubber spatula like I did. I learned the hard way that this can melt really easily, which isn’t a flavor you want in your chocolate. Remove the small sauce pan with the chocolate in it from the medium sauce pan and drizzle the chocolate slowly over the crumbled sugar cones. After pouring out all of the chocolate, add the other bag of chocolate chips to the pan and repeat the process of heating up the chocolate and pouring it over the sugar cones. Next, place the whole baking tray with the chocolate and sugar cone mixture in the freezer or the fridge (wherever it will fit). Let it sit in there for about 20 minutes or so until the chocolate has basically hardened. Note: If you want to add anything else to the bark such as hazelnuts or something like that then this is the time prior to cooling the chocolate. Once the chocolate has hardened, drizzle two tablespoons of vanilla glaze (I just bought some rather than made it myself) in a kind of criss-crossed pattern or any other pattern you would like. Then cool the glaze in the fridge or the freezer for another 15 minutes or so. Lastly, use a sharp and heavy knife to break up the bark. I just cut it into strips and then across to make squares. The chocolate will break apart into random pieces, but that is to be expected. When not serving, keep the bark cold in an air tight if you want it to remain solid and crunchy. This looks like a great garnish for some holiday-themed drinks! I love dark chocolate! I’d be extremely interested to see if you come up with something for the holidays that could incorporate this! Thanks! They tasted pretty good too. I made sure to give half of it away because I didn’t trust myself not to eat it all.